Powerhouse bluegrass singer and songwriter, Cindy G., a native of the northern most reaches of Appalachia, in the hills of southwestern Pennsylvania, announces the release of her newest project, Jail Break, produced by Jim VanCleve, with an all-star cast of musicians and singers along with exceptional instrumentation and songs, most of which are original. 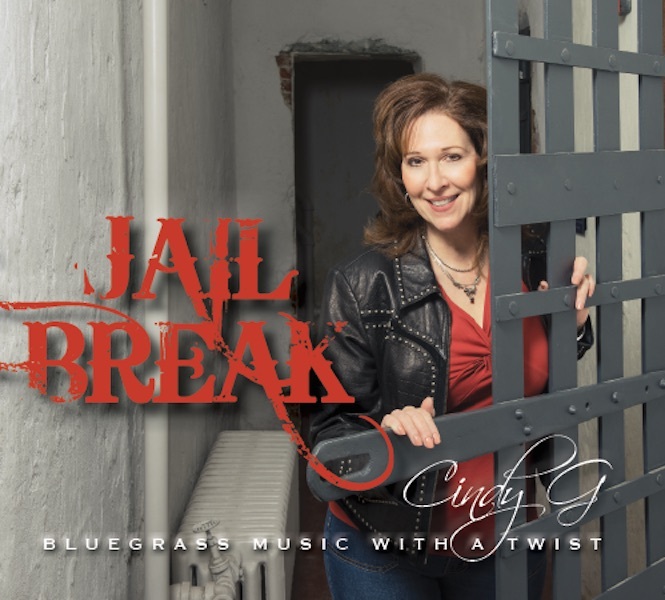 Jail Break, not only features Cindy’s fine songwriting and her soulful, textured vocals, but also the world-class artistry of players like VanCleve, Rhonda Vincent, Sam Bush, Scott Vestal, Rob Ickes, Bryan Sutton, Aaron Ramsey, Seth Taylor and Todd Phillips. Her newly released video for the title track has also been added for airplay on CMT.com (Country Music Television online), GAC (Great American Country), and Zuus! Producing this project with Cindy has been both a pleasure and a privilege. Rarely do I get to work with someone as professional, as driven, and as visionary as she has been throughout the process. She is obviously both a talented performer and songwriter, but perhaps equally important, she is a DOER. She has a strong character, an emotional connection to her material, and in general, a big heart! All of this comes out in her craft – Jim VanCleve. Cindy’s songwriting inspiration comes from mostly real life experiences and true stories, recalling the local legends and folklore from her home state or anywhere she’s been. She also has an uncanny knack for conjuring up the lyrics and emotion needed to tell an imaginative tale, while listeners wonder whether it’s a true story or not. Jail Break has all of this and more. On “Living Picture (The Story of the Mather Mine)“, Cindy imagines what one miner’s thoughts might have been the day he never returned home to his wife and unborn child after a real life, 1928 PA mining disaster. “Wilds of Wise County” embellishes on a “true” ghost story from Virginia’s Blue Ridge Highlands, and her own take of the old Osborne Brothers song “Ruby, Are You Mad” is a standout cut. But, the title cut “Jail Break“, featuring Rhonda Vincent as a guest vocalist, Sam Bush on mandolin, Scott Vestal on banjo and Seth Taylor tearing it up on guitar is a bluegrass lover’s anthem through and through and characterises what bluegrass music is truly all about! Her last video “444 Chicken Bone Road” went to #1 on Yallwire’s National Video Chart in April 2015. Cindy has appeared on Heartland TV’s “Bluegrass Ridge” and The Family Channel’s “Cheyenne Country TV“. Her critically acclaimed debut CD, The Road (2012), first brought her to the attention of bluegrass fans who have been falling in love with her warm vocals and emotional songwriting ever since. Filed Under: CD Releases Tagged With: Cindy G.
Just loved that one Greg. I had not heard of her until yesterday when the press release came through. She has a fine stable of musicians playing alongside her.